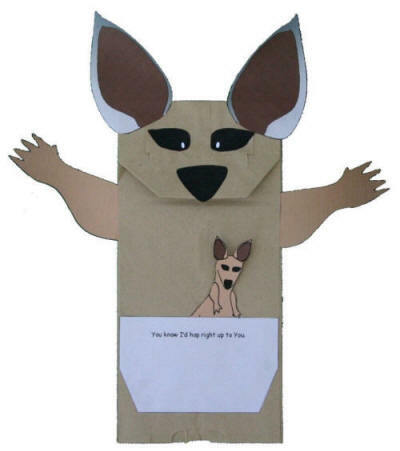 This is a paper bag puppet craft. It has been made especially for the song (it has a banner with "You know I'd hop right up to you."). There is also a kangaroo toilet paper roll craft if you'd like to make a kangaroo with different materials. Colour the pieces as appropriate and cut them out. (cutting may require adult assistance and can be pre-done). See the picture above for how the puppet should look when complete. I'm going to walk through this slowly. Look at your paper bag. It's important that all the kids get the back and front straight at the beginning! When the child put's her hand in the bag, she'll be able to make the puppet talk. Look at the rest of the front of the bag. (The 3/4 or so of the bag below the part with the flippy tab) This will be the BODY. We'll be slipping the arms (template 2) into this flap. If the kids goof and glue the arms onto the front or back of the bag, it isn't a big deal. OK, now that we're comfy with our bags, let's craft! Glue the nose to the bottom of the newly made triangular head. You can let it hang down a bit to extend the face and make it look even more triangular. Glue the tongue under the flippy tab so it only shows when the mouth is open. Glue on the eyes and ears. Glue or tape the pouch onto the front of the bag. Only put glue on the bottom and sides, NOT on the top edge (if you put it on the top, the joey won't be able to get it!). Tape may be safer here as it's easier to get the top opened if the child accidentally tapes it shut. And you don't have to wait for it to dry! See the blue lines below for where to glue. Once the glue is dry, slip the joey into the pouch. You can glue him in or leave him loose (loose is more fun at playtime, but you run the risk of losing him).